Holders Carlton survived a real scare to progress to round two of the Citylets Scottish Cup. The Grange Loan men headed to Drumpellier and made 160 all out batting first, Ali Shah battling for 51 in a team that included a number of young players. The hosts then saw Henry Dall hit a 50, but a great bowling effort for Carlton saw Drumpellier all out for 152 as the Capital men won by eight runs. James Hearn smashed 82 not out as Heriot’s made it six wins out of six in all competitions with a comfortable win over Irvine. They bowled the visitors to Goldenacre out for 128, Michael Shean leading the way with three wickets. In the reply, Hearn’s runs and 40 not out from Loedolff Potgieter saw Heriot’s come out on top by ten wickets. Mazars Grange went to Ayr and won. Chasing 221 for victory, Ryan Flannigan was the mainstay of the innings with 89 not out while 43 from Gordon Goudie and 38 not out by skipper Preston Mommsen saw them home by seven wickets. 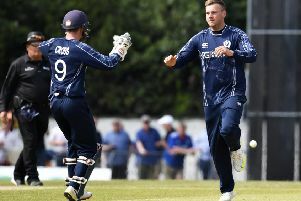 Captain Ewan Chalmers hit a brilliant 94, but Watsonians were beaten by Forfarshire at Myreside. Stewart’s Melville lost by four wickets at Ferguslie. Hayden Sweet top-scored with 64, but it was not enough.